The death toll from flash floods in Papua province, eastern Indonesia, rose to 89, the National Disaster Mitigation Agency said on March 19. The number of dead is expected to rise as rescue workers are searching for 74 people reportedly missing. The agency’s spokesman Sutopo Purwo Nugroho said about 6,800 residents were evacuated to temporary shelters. 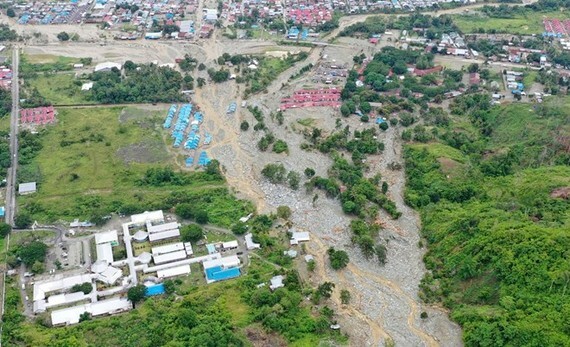 According to him Sentani near the provincial capital of Jayapura is the worst hit area, where tonnes of mud, rocks and trees from a landslide on a mountain rolled down to a river that burst its banks, sweeping away residents. Flash floods and landslide struck at the weekend after torrential rain fell on March 16 in Sentani, close to Jayapura city. Indonesia is frequently hit by floods and landslides during the rainy season which runs from October to April. In January, floods and landslides killed at least 70 people on Sulawesi island, while earlier this month hundreds in West Java province were forced to evacuate when torrential rains triggered severe flooding. The ASEAN Trade in Services Agreement (ATISA) and the fourth protocol amending the ASEAN Comprehensive Investment Agreement (ACIA) were inked by ASEAN economic ministers in Thailand on April 23.